Sammy McIlroy was born on 2 August 1954 in Belfast in Northern Ireland. He was an intelligent and very skilful midfielder. McIlroy was spotted by the Manchester United talent scout Bob Bishop playing in his native city. At just fifteen years of age he arrived at Old Trafford while legendary manager Matt Busby was still manager. Sammy McIlroy was the last of the Busby Babes. 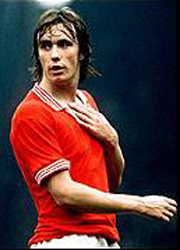 Sammy McIlroy made his Manchester United debut on 6 November 1971 against Manchester City at Maine Road. Despite being just 17 years of age and making his first appearance for United, McIlroy was far from daunted by the occasion. In fact he revelled in the derby atmosphere and scored on his debut and provided an assist for another goal as the Reds drew 3-3. Sammy McIlroy joined fellow Irishmen Tony Dunne and the brilliant George Best in the team that day. McIlroy went on to make 21 appearances in all competitions in the 1971/72 campaign - eleven of them as substitute. He scored four league goals that season. ten goals as United stormed back into the First Division. McIlroy continued his impressive form as United made an impact on their return to top flight football. United finished third in the League and reached the FA Cup final as McIlroy made another 51 appearances and scored 13 goals. This was his best goal tally for a season with Manchester United. Unfortunately for McIlroy and United Southampton created a major upset by beating the Red Devils 1-0 at Wembley in the Cup final. Happily Tommy Docherty guided United to the FA Cup Final the next year. McIlroy appeared alongside fellow Northern Irishmen, Jimmy Nicholl and David McCreery, as United beat Liverpool FC 2-1 through goals from Stuart Pearson and Jimmy Greenhoff. It would prove to be the only major honour that Sammy McIlroy would win with Manchester United. Hardly a true reflection of a player of McIlroy's calibre. McIlroy continued to play for another four full seasons during which he continued to score important goals for United. While the Reds did reach another FA Cup final in 1979, memorably losing 3-2 to Arsenal, the elusive and much craved-for First Division title never arrived. With Ron Atkinson at the helm at United in the 1981/82 Sammy McIlroy gradually fell out of favour despite scoring a hat trick for United against Wolves on 3 October 1981. In fact his third goal in that match turned out to be Sammy McIlroy's last goal for Manchester United. In February 1982 Atkinson sold McIlroy to Stoke City for a fee of £350,000. Sammy McIlroy made his international debut for Northern Ireland on 16 February 1972 against Spain at Windsor Park in a European Championship qualifier. The match ended in a 1-1 draw. He had to wait almost four years for his first international goal. McIlroy scored for Northern Ireland against Norway on 29 October 1975, once again in a European Championship qualifier. He played in all five of Northern Ireland's matches at the 1982 World Cup finals. He played in that truly memorable 1-0 win over Spain who were the hosts. Sammy McIlroy also captained Ireland during the 1986 World Cup finals in Mexico. McIlroy's last goal for Northern Ireland was in a 2-0 win over Scotland in the 1984 British home Championship. It was the last staging of the tournament and Northern Ireland won the championship on goal difference. The trophy was permanently awarded to the Irish FA. Sammy McIlroy's magnificent international career came to a close on 15 October 1986 against England. A career that spanned almost 15 years, 86 caps, five goals, two World Cup finals, and a victory in the last British home Championship.